In a small town on the Italian coast, a mysterious woman washes ashore. She is crippled, mute, and clutches a bundle to her chest-a baby the townspeople insist is a real-life mermaid. It can only bring bad luck; they pay a troupe of acrobats to carry mother and child away. In the bustling trade center of Venice, merchant Paul Pindar is the subject of his colleagues' concern. Since his return from Constantinople, they have found him changed; raging over the loss of his beloved, Celia, he has gambled away his fortune at the gaming tables. But when a priceless blue diamond surfaces in the city, Pindar recognizes the opportunity to regain everything he has lost-including, perhaps, the woman he loves. A celebrated writer of history and travel books, Katie Hickman has always been a master of evoking time and place. With The Pindar Diamond, her follow-up to The Aviary Gate, she brings early-seventeenth-century Italy vividly to life, and also demonstrates her maturity as a novelist. 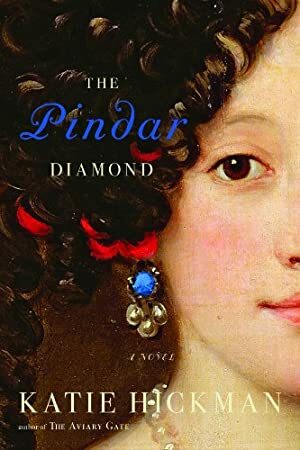 A tale of love and avarice, with a touch of the mystical, The Pindar Diamond is rich with historical detail, and unfolds with urgency and grace. It is accomplished, wholly satisfying historical fiction. Track It. This book has been $3.70 within the past year. Log In to track Katie Hickman on eReaderIQ. to be notified each time the price drops on any book by Katie Hickman. to stop tracking Katie Hickman. We started tracking this book on January 18, 2011. The price of this book has changed 240 times in the past 3,017 days. The current price of this book is $6.54 last checked one day ago. This lowest price this book has been offered at in the past 90 days is $5.60. This lowest price this book has been offered at in the past year is $3.70. The lowest price to date was $1.13 last reached on June 15, 2012. This book has been $1.13 one time since we started tracking it. The highest price to date was $11.99 last reached on October 5, 2017. This book has been $11.99 6 times since we started tracking it. We last verified the price of this book about one day ago. At that time, the price was $6.54. This price is subject to change. The price displayed on the Amazon.com website at the time of purchase is the price you will pay for this book. Please confirm the price before making any purchases.